At West Bend Elevator, you come to see us because you need to get stuff done. It can be hard work, running an errand or it can be a fun project. We have the products and, most importantly, the people to help you get it done. From lawn care to pet food and beyond, our large store has it all. Whether residential or commercial, our Landscape Division is ready to help. For 70 years, we’ve provided high-quality feed services. 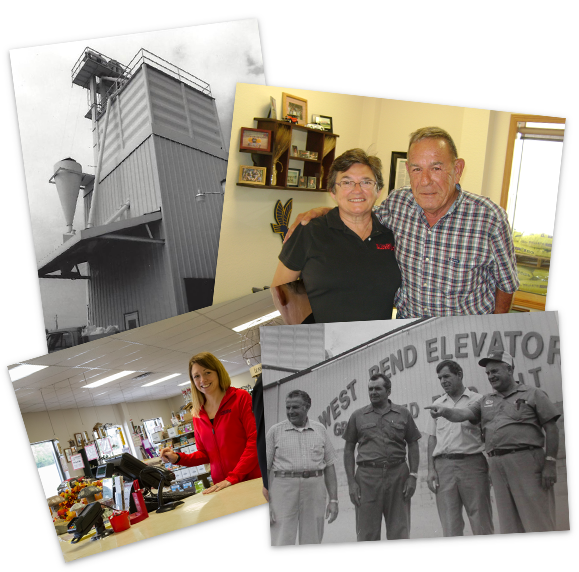 Buying, selling, drying, and storing – we do it all here at West Bend Elevator. At West Bend Elevator, you come to see us because you need to get stuff done. It can be hard work, running an errand or it can be a fun project, but you need to get some traction. You need action. And, you might need help. We can relate. We have to get stuff done, too. There’s only one way to do it – get moving. The right tools and a little know-how to start with go a long way, too. We have the products you need, but we have something for you that is even more valuable – our people. We can help with experienced advice to help you choose the right products or tools in the first place. We’ll make sure you figure out the right amount of what you need and then help you load it into your vehicle. If you don’t have time to come in, our website is the perfect tool to get you started. Look around. Learn and see what you need. If you have any questions, just give us a call. We’re here to help. The hardest part of any job is getting started. Once you get going with the right tools, products, and know-how, a working rhythm sets in and momentum takes over. It’s a great feeling. Since 1947, we’ve been here for you. When you come in, you’ll see some familiar faces that have been here to help … generations of them, in fact. And we’ll be here to help you well into the future. If you have a challenge or even if you just need some help on which is the best product to buy at a fair price, you don’t have to go it alone. Our people are real and our advice is honest. That’s helpful. That’s West Bend Elevator. Real. Helpful. For you.